With the IT boom a lot of apartments have come up across Bangalore, especially where IT jobs are in plenty. We list the going prices across Bangalore for apartments. Lake Verandahs is an upcoming 3 BHK apartment project from the House of Hiranandani in Bangalore and is be located on Bannerghatta Road. The Hill Crest project by Hiranandani on Bannerghatta Road, consists of 3bhka apartments, along with the other projects, is touted as one of the best projects in the city. Edenhall by Hiranandani on Bannerghatta road comes with a number of world-class amenities which will we add an oomph factor to your life style. Club Meadows apartments located on Bannerghatta Road in Bangalore is an offering of House of Hiranandani. 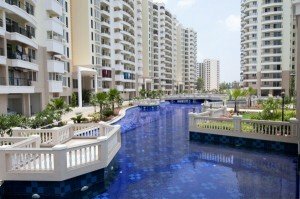 The House of Hiranandani has introduced a unique concept of New Urbanization that has at its crux the challenges faced by builders when it comes to developing environment friendly projects. Godrej Platinum 3 & 4 BHK Apartments at Hebbal, Bengaluru offers you high living with exclusive amenities right at your door step. The beautifully designed high-rise apartments by Godrej Properties come with a dazzling view of the Hebbal Lake. Godrej E-City apartments by Godrej Properties is perhaps the lushest spot in the whole city of Bengaluru. The project, which has been aptly named due to its close proximity to electronic city.